Discussion in 'RED DWARF UNIVERSE' started by thinkingman, Dec 18, 2017. 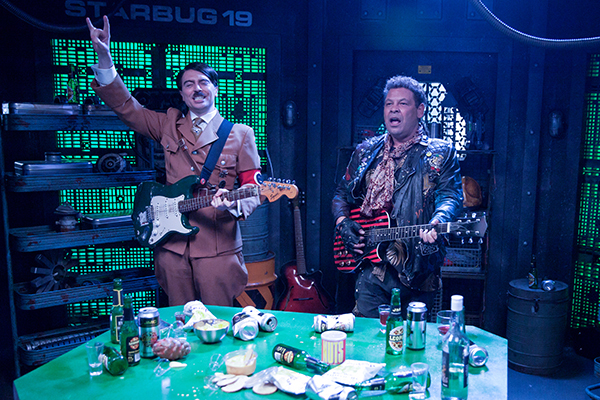 Honestly, what did everyone think of the winners of the Red Dwarf Poster Competition? My gripe is that personally I didn't find the winners at all bold like what was asked for in the brief. Sure they were creative, but not bold. They'd suit being on magazine covers rather than posters. I simply can't share the excitement that others seem to have about the winners since I don't think they're that great. The winner's poster annoyed me the most though because Doug should have noticed that the spacesuit wasn't correct (they don't have yellow boots), and "Thursdays" had a capital "S" at the end. And whilst we all know Lister's guitar has changed in each series it's been shown, the one in the poster is nothing like the one in series XI/XII. Here's the link for anyone wondering. I like a lot of those I have to say, particularly 1st and 2nd place, also in the college of 'other entries' there are several really cool ones. I love the one with Lister painting the XII although would have flipped the colours. Did you enter @thinkingman? Would like to see your entry (oooer Mrs) if so. I quite liked a lot of them, some were pretty cool. What would you consider bold though @thinkingman like if there was a poster where Lister had his bum out? I like the winner, 2nd and 3rd place are good, but I have seen better entries. The winning work looks very good. I love how it contains lot of stuff from series XII - planet Rimmer, Listers's spacesuit, guitar. And whilst we all know Lister's guitar has changed in each series it's been shown, the one in the poster is nothing like the one in series XI/XII. It's the guitar Hitler lent Lister in Cured. I really liked the winner too. Excellent for a poster or even a DVD slip cover imho. 2nd and 3rd were very good also. Many of the entries were excellent and I'm sure the choosing was very hard. Man, I'm sitting here thinking that I'd like to have a copy of that winning poster ! Tbh I was disappointed that the winner didn't have anything about some really awful parts of an episode that I can't talk about because of the spoiler policy. Gee @Abe but more Christmassy and all ,since you can't think of anything even remotely appropriate to the thread's topic to say, why don't you put something else in your Sig.? Been a week or so you know. Be mindful of the spoiler policy in this thread btw. Maybe the thread should be in the XI/XII conference anyway. Abe and FeeBee like this. I personally liked them, second place and the first poster of the selection of some of the entries were my favourites. I would gladly have those as posters in my computer room.